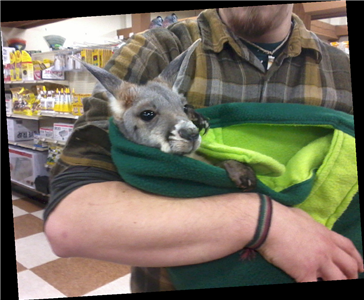 Jordan Woolsey, retail store associate in Mount Vernon was quick to snap this photo during a recent customer visit. This baby kangaroo belongs to The Outback Kangaroo farm in Arlington. Local resident Cody Connite rears the babies in his home until they reach one year old, one of the volunteer benefits of working at the farm. Woolsey questioned Connite about the daily nutritional feed requirements of the exotic baby animal and Connite replied, “Mostly just kangaroo food, milk and on occasion their favorite treat, bananas.” Also residing on the farm are kangaroos, wallabies, wallaroos, llamas, lemurs, alpaca, pygmy goats, peacocks, an ostrich, a mini donkey, a parrot, and an emu. During the visit Woolsey was led to understand that exotic animal life is abundant in the county and commented that SFS was able to order and supply many of the owners with a constant supply of exotic animal feed through the Mazuri brand. From alligators to zebras, retail associates should familiarize themselves with the diet reference guide available. This will lead SFS to have knowledge and provide information for our customers who entertain the wilds of the world while housing the exotic pets in the county.